Rugs are one of the essential component of any kind of home or office decorations. Rugs are available in number of different forms like contemporary rugs, Persian rugs, kilims and so on. 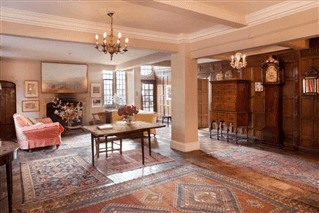 Oriental rugs are one of the customary rugs popular for their ancient backgrounds, unique design and development distinctive. Recent rise in the demands of oriental rugs largely increased their productions and as a result large varieties of oriental rugs are available in market with different textures, designs and colors. Selection of a befitting rug is crucial as and when you go to purchase it, for the better results you should be aware of various rugs available in the market with their performance parameters. Although oriental rugs denote the ancient textures but their design differ from one country to another according to the country of their origin, mostly artists use their own conventional design patterns in oriental rugs. Real Oriental rugs are so catchy that anyone with the little knowledge of them can distinguish between a quality oriental rug from an ordinary one. Persian rugs are the refined representation of oriental rugs. Persian rugs are one of the most preferred and expensive brand names in the market. These rugs are basically originated in Iran since the long times back and now got popularity throughout the world because of the higher quality and extra ordinary design techniques. These oriental rugs mainly include the scenic beauties, floral designs created after the months of hard works of the expert artists.